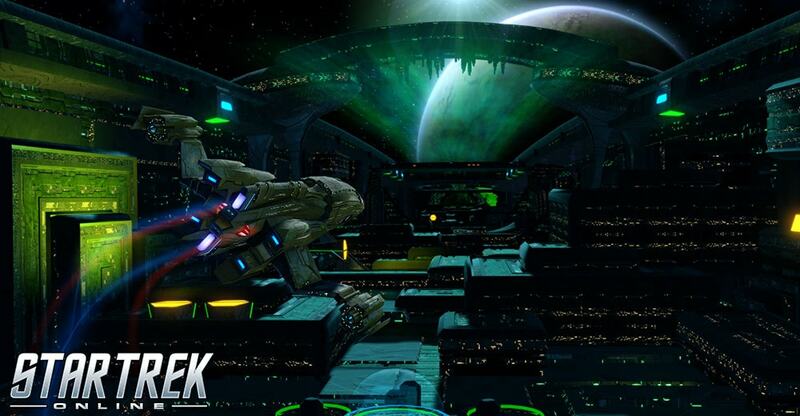 The Star Trek Online Team is pleased to bring back the Breach special event. For the special event version of the Breach, Captains will be flying a streamlined route into and out of the Voth Fortress. From March 8th 8:00AM PST to March 29th at 10:00AM PST, Captains between levels 50-60 can queue up for our 5-captain “Breach Event” to defeat the Voth City Ship and earn one Voth Operative Transmission every 20 hours. After collecting 14 Voth Operative Transmissions, players can complete a new Event Reputation project to be rewarded with 50,000 Dilithium Ore, 500 Fleet Marks, 250 Marks of their choice, and a brand new Universal Console, Voth Phase Decoy. Completing this project on any character will unlock this new Universal Console for all characters across your account, and additionally the other characters can still complete the project to receive the Marks and Dilithium Ore.
Activating the Voth Phase Decoy Console will cloak your ship for up to 20 sec, disabling your shields and preventing you from taking most actions. It will also summon a duplicate version of your starship to fight and distract your foes for as long as you remain cloaked. When destroyed, the duplicate will emit a pulse that sets engines offline and deals Electrical Damage to foes within 10 km. Additionally, the Voth Phase Decoy Console provides a passive boost to Maximum Hull Capacity and Antiproton Damage. To participate and earn Voth Operative Transmissions, queue up for either the Normal or Advanced version of the event – a successful completion of either will award you with one Voth Operative Transmission in addition to your choice of Marks. Completion on Advanced will also reward Voth Cybernetic Implants, which can be used in Dyson Reputation projects. After the run of this Breach Event, the regular Breach queue will again return with its normal rewards. Gather your friends to journey once more unto the Breach, and we'll see you in-game!